The DIRECTV Kids App is an easy and safe environment that offers hundreds of popular children’s shows and kid-friendly movies. With DIRECTV, now your kids can enjoy their favorite shows and movies anywhere, anytime—at no extra charge. The new DIRECTV Kids App is free for customers and offers hundreds of popular children’s shows and kid-friendly movies available to watch instantly from Nickelodeon, Disney, Cartoon Network, HBO®, STARZ®, Sprout and more! Designed for kids to use, it streams all the kid-friendly movies and shows from the networks you’re already subscribed to. The DIRECTV Kids App is intended take the worry away from watching TV and give kids a simple and safe viewing environment without the need for complicated parental-control setup on multiple devices,” said Tony Goncalves, senior VP of DirecTV’s digital entertainment products group. Fun for kids. Peace of mind for parents. 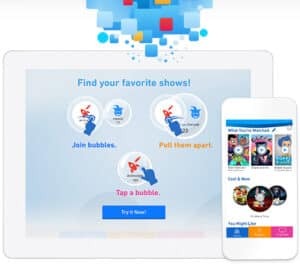 Specially designed with big buttons and our unique bubble filters, the DIRECTV Kids App makes it fun for kids to search and play the shows they love. Parents, rest easy knowing it’s a safe viewing environment created just for children—with parental ratings and reviews provided by Common Sense Media Ratings. For a fact sheet with complete details and FAQs, click here. Please note: The DIRECTV Kids App is currently available for iPhone and iPad only.